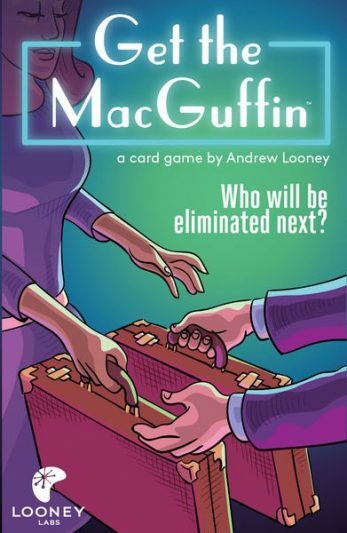 Looney Labs is at it again with their new game, Get the MacGuffin. After spending all morning searching for our copy of Get the MacGuffin—which could have been a film all in and of itself—we played this fast passed, take-that game of plot device stealing fun! Like the majority of Looney Labs games, Get the MacGuffin is a quick card game for 2-11 players where play pivots at every moment. The ultimate goal is to be the last person standing, and obtaining and keeping the MacGuffin is the surest way to do so. Look out though, because spies, tomb robbers, and assassins are everywhere, and they will use every tool at their disposal to eliminate you. Each turn, a player performs one action by playing a card from their hand, or activating a card on the field. Most of your cards will affect the game state by removing, stealing, or trading cards in some form or fashion. On your turn, if you have no actions to take, you are out! The MacGuffin gives you unlimited actions, but only for as long as you can hold onto it. During our game, it quickly became a competition between the holder of the MacGuffin and the wearer of the Crown. On the first turn the Crown was revealed, only to be assassinated shortly after. The Garbage Collector went searching for it, but was thwarted when the MacGuffin hit the table. The game then became a grab for power as the Thief, Merchant, and holder of the Money each stole the MacGuffin out from under the previous owner. 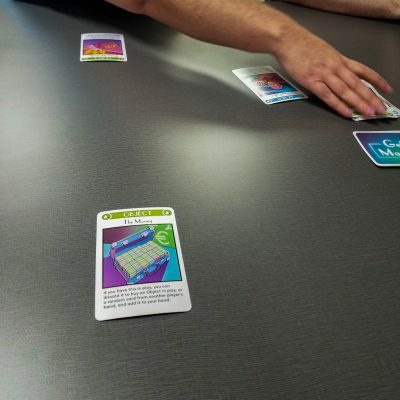 Over all, the game is a solid experience as a both a filler game and a party game, and plays well both at 4 players and 11. We would like to thank Looney Labs for this great donation. 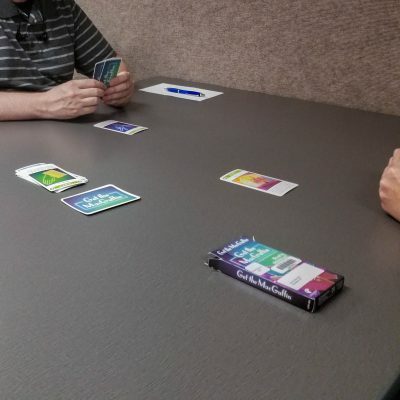 If you would like to play Get the MacGuffin or any other game from Looney Labs, they are available for check out here, at the UNT Media Library. Posted August 28th, 2018 by Jeremy & filed under Board Games.